Such happiness when summer makes a perfect marriage with architecture. With the hot season beckoning, it’s none too early figuring out how to remain more or less comfy in torrid temperatures. There’s much to be said for air conditioning, obviously, but that doesn’t help at all when good folk are outdoors, attempting to avert heat stroke. One reasonable solution is just sitting down somewhere, doing nothing. Perhaps a shaded park? How about Gate No. 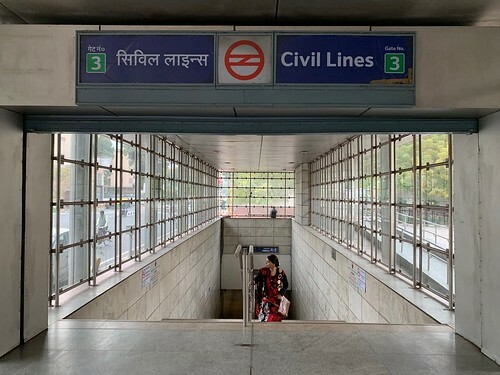 3 at the Civil Lines Metro Station in north Delhi? 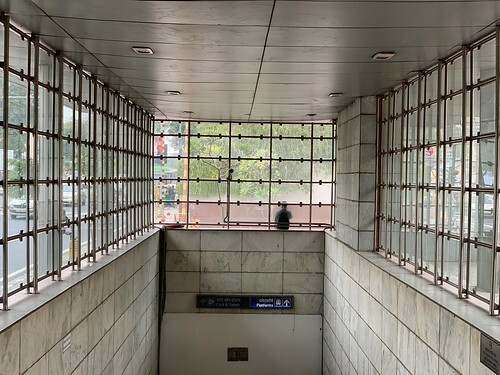 Its grand passageway leading into the depths is more than merely tolerable, because frigid drafts from air conditioners below are pushed upwards. No wonder college students at nearby Delhi University—many of whom reside in the area—can be found sitting around the entrance, poring over textbooks on a hot afternoon. Or, just chit-chatting with friends at this station which is pleasingly languid and slow. 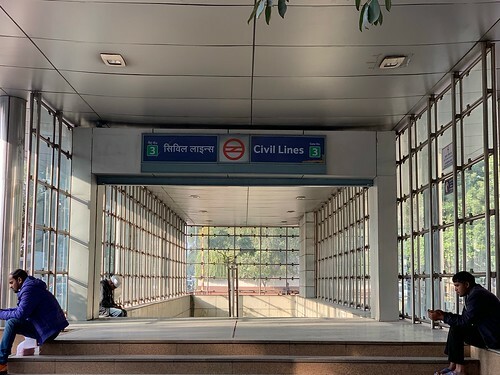 Compared to the staunchly commercial nature of the hectic station right on the University campus itself (Vishwavidyalaya), which is more like a market place of snack stalls and banner ads. Indeed, here in Civil Lines, it is charming to eavesdrop on the students’ conversations that transport you briefly into the concerns and pursuits of an altogether different world. This afternoon, however, these young folks are chatting what everybody else too is chatting about—the forthcoming general elections. The place also gets its fair share of loners who lounge here to nourish their solitude. 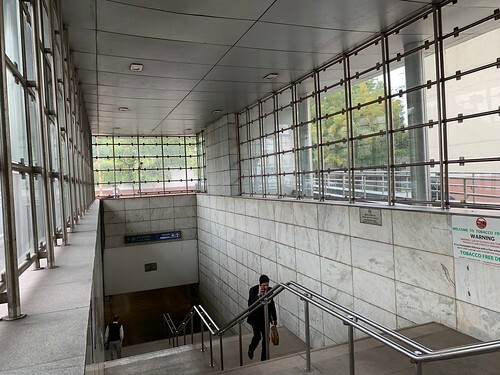 There’s also something to be said, as well, in favour of the station’s structural design at the entrance, grandly dimensioned with glass-paneled walls. Check the guy leaning on the other side of the wall—the distorted refraction through the glass makes him look like a super-creative smudge in a painter’s canvas that effectively conveys more of his soul than the body. In all, the entire place is flooded with indirect sunlight but remains cool, inviting, and almost secretive. It’s rather like sitting under a tree in a verdant garden, but far more bizarre since there’s no tree, no garden at all.